The Insect Control System provides around the clock 24/7 bait delivery, plus long-term control and monitoring. Uses only low toxic baits, or other environmentally sound ingredients that are designed to eliminate total ant colonies and not just the foragers. Focuses delivery so products are not exposed or broadcast over wide areas, but remain contained within delivery unit. Baits are restricted to reservoir, and feeding pool when activated. The Insect Control System protects homes and properties while creating less need for interior services. It greatly decreases the number of bothersome service call-backs. As a homeowner, you are provided a recognizable, ongoing sense of security and peace of mind. Access restricted to only ants, roaches, and other small insects. Locking screw provides tamper resistance. Insects have 360 degree access to bait pool. Ultra Violet filtering green color of dispenser blends into surroundings, but is apparent enough to locate. Insects trigger the release of bait into the pool. The Insect Control System is currently in use at homes, offices, condos, hospitals, military bases, public facilities, national parks and historic sites including on-going participation in University of California field research studies at both urban and agricultural sites. 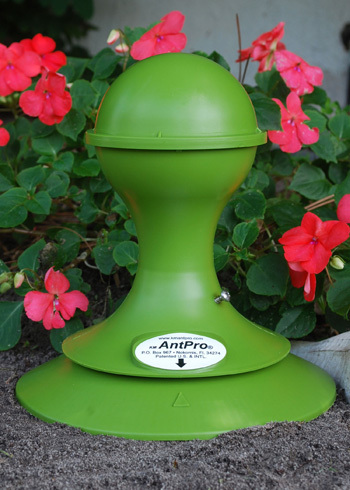 The Insect Control System's long term, stand alone 24/7 safe non-invasive methodology effectively eliminates ants, roaches and many other problematic insects.